On Sep. 1st, 2011, Mr. Mangesh from Nagarjuna Training Institute (NTI) at Nagaloka, India, visited Buddhist Hongshi College and asked me about my views on ethical issues regarding monastic-lay community orders. Right away, I told him that both Buddhist monastic and lay practitioners should be equal. It will be better if all of us work as a team to jointly spread the Dharma and help all sentient beings. We can work on different tasks basing on our specialties, but we should not emphasize that bhiksus and bhiksunis ought to enjoy more privileges when they perform their duties teaching Buddha Dharma and benefiting sentient beings. Mr. Mangesh felt very joyful when he heard my comments and he shared the following observation with me. He has noticed that the monastic community enjoys much higher status in contrast to its lay community within the Buddhist community order in Sri Lanka. On the contrary, in India, most jobs to spread the Dharma and help all sentient beings are performed by lay Buddhists. With his sharp insight accompanied with his acute awareness of the casted system in India, Mr. Mangesh thus commented on such inequality between monastic and lay orders: it privileges Buddhist monastic members as if they were those “br?hma?as.” Such an expression echoes the observation I’ve made. In 2005, I have written a paper and condemned such monastic-centered ideology that emphasizes and privileges monastic orders above all: it leads to the traps and danger to create a “new br?hma?a” class within the Buddhist community as a whole. Since I have been promoting gender ethics and equality, written various papers as well as a book dedicated to this issue, and initiated a gender equality movement to abolish attha garu-dhamma (“the Eight Special Rules”) at the end of March, 2001, I will not discuss issues related to gender ethics in this paper, although it aims to examine the controversies regarding “equality among all four groups of Buddhists.” In the following, I shall directly address ethical issues regarding Engaged Buddhism and the relationship between monastic and lay Buddhist orders. 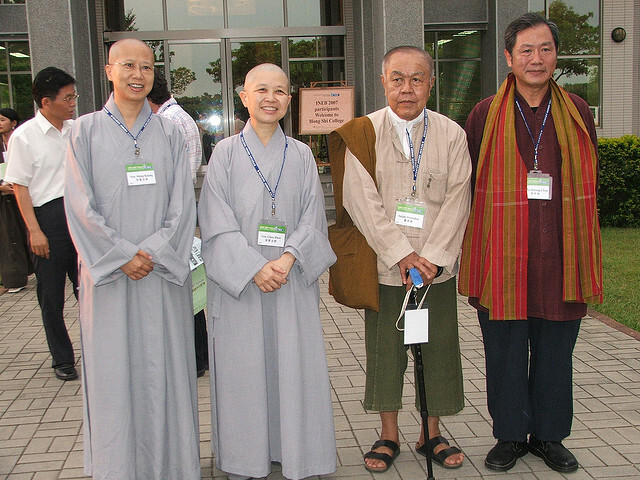 The issue whether “the monastic order should be treated as superior to the lay order” or “both communities should be treated as equals” has generated major disputes with ethical concerns within the Buddhist community as a whole. Such disputes can also be observed within contemporary Chinese Buddhist communities. Lay Buddhists should not be categorized along with the monastic. They do not belong to trini yanani (the three sage types), nor should they be treated as punya-ksetra (the fields of blessing), nor should they be treated as masters or role models. They should not teach Buddha-dharma. They should not study vinaya. Bhiksus should not study with lay Buddhists. They should never prostrate or bow under lay Buddhists. Nor should they be ranked along with lay Buddhists. Venerable Master Yin-shun (???? ), who had dedicated his life promoting “Humanist Buddhism” (??? ?Buddhism in the Human World), had certainly read about the debating arguments written by both. He did not join the debate right away. However, after twenty-six years, in 1953, he wrote an article that has still been held with high esteem by lay Buddhists: “Directions to Establish Lay Buddhism.” In this article, he observed the development of lay Buddhism with very positive attitude. He even pledged the hope of the “Revival of Buddhism” upon lay Buddhism. The revival of Chinese Buddhism is a mission involving such myriad tasks that we may not really know where to begin. However, we have always believed that we should focus on the three following areas: Buddhism of the young, Buddhism of the intellectual, and Buddhism of all lay followers?. Among the three, lay followers’ Buddhism should be the most important. Buddhist Institutions, Scriptures, and Teachings 82. For the future of Chinese Buddhism, we pledge our profound hope upon the development of lay Buddhism. Buddhist Institutions, Scriptures, and Teachings 93. With Mahayana Buddhism, lay bodhisattvas no doubt play a more significant role in comparison with monastic bodhisattvas. Buddhism does not only belong to the monastic home-leavers. In terms of faith, studies and practices, attainment, whichever perspective we take to observe their significance, monastic Buddhists and lay Buddhists can be said to be completely equal. If the development of lay Buddhism causes the decline of monastic Buddhism in such a serious way that it can no longer exist, the real cause of the problem does not lie in lay Buddhism. Instead, the problem lies in the downfall of monastic Buddhists?they themselves cannot cope with the time and develop Buddhism along with the time. If monastic Buddhists themselves are wholesome and sound, if they are deeply immersed in the Buddha’s teachings and learn to adapt to the needs of sentient beings around their time, then they will surely work together with lay Buddhists so as to march forward with them. Furthermore, by doing so, in Buddhism, they shall always be taking leading positions. It could be inferred that when Ven. Yin-shun suggested that “in Buddhism, they shall always be taking leading positions,” he meant well and was trying to console those monastic members who were worried that their “leadership would be deprived.” In fact, in my view, similar disputes over “who should take the leading positions, monastic or lay Buddhists” are all mixed with some sort of unwholesome working of the mind that is trying to compete or satisfy one’s vanity. If we really take it to be our duty to spread the Buddha’s teachings as our ways to return the blessings endowed upon us by the Three Jewels and all sentient beings, both monastic and lay Buddhists should only think of how to “best place the talents upon the best positions” so as to benefit maximum sentient beings. There is really no need to calculate or argue who should take leading positions. I think that in some occasions, especially when we are conducting Po?adhas (the monastic assembly held among members of the monastic community every fifteen days to examine their everyday life practices), we should not only recite the vinaya, but before reciting the vinaya, we should also conduct self-examination discussions to list behaviors that violate vinaya precepts or expose mistakes to be corrected. At these occasions, it would certainly be very unfair for those bhiksus and bhiksunis whose behaviors or mistakes are exposed if lay Buddhists or cramaneras and cramanerikas were present, since these people are not obliged to follow the vinaya but as spectators, they might abuse the right to comment and criticize those being examined at the meeting. Therefore, it is righteous and fair to ask un-related participants of Po?adhas meetings to leave so as to ensure that the monastic obligations we require these concerned monastic members to abide by and their rights to be protected are equally taken care of. Even if we concede that this policy to excuse un-related personnel from the meetings so as to protect the self-esteem of concerned monastic members may be extended to justify the discourse that “monastic affairs should be resolved within the monastic community,” and that this is an issue to be resolved within the community of concerned members, I still think that this is only a basic common sense knowledge among all social organizations to guarantee “equivalent treatment between obligations and rights” of their members. This should not be treated as means to highlight the “privilege” or “status” of bhiksus and bhiksunis. It does not only apply to Buddhist monastic communities, it also applies to the operations of all social organizations and communities in general. Under normal circumstances, the internal affairs of every organization should be jointly decided by the members within that organization?it may be conducted through a delegate system, it may also be conducted via a democratic system directly decided by all members. Nevertheless, monastic members still ought to take and accept comments and suggestions made by lay Buddhists or even non-Buddhist societies. Even if there is criticism, monastic members should take it with the attitude “to correct errors if there are any, and to praise and encourage the members if no mistakes are made as criticized.” In any case, it is not proper to twist the original purpose of “resolving monastic affairs within the monastic community” and use it as a defensive measure to block the gate to receive good advice and to terminate all kinds of comments provided by lay Buddhists or public criticism raised in the society. Nor should we use it as means to elevate our own status or positions. Such a practice is justifiable and we can find concrete supports in the Vinaya-pitaka, vinaya collections, because it is the right and duty of “reliable up?sikas,” reliable female lay Buddhists to “bring up mistakes made by bhiksus.” The two “aniyata” among the precepts for bhiksus refer to the regulations and measures the monastic community should take when lay female Buddhists file accusations of suspected cases of bhiksus’ misconducts that might violate the bhiksu’s precepts. Furthermore, if we study the “vinaya-vibha?ga” among all vinaya scriptures, we will find out that many precepts for bhiksus and bhiksunis were set by the Buddha to prevent repeated misconduct of samgha members and their negative impacts on the society. We can find that the vinaya scriptures were set in response to lay Buddhists’ reports about some samgha members’ evil speeches and evil deeds: the Buddha had these vinaya regulations clearly set after he checked with the people involved and found the misconduct to be true. He had these precepts clearly specified so as to prevent the same misconduct from happening, to protect the samgha from “the criticism and mockery by lay Buddhists,” and to ensure the people in the society will not lose faith in Buddha-dharma. 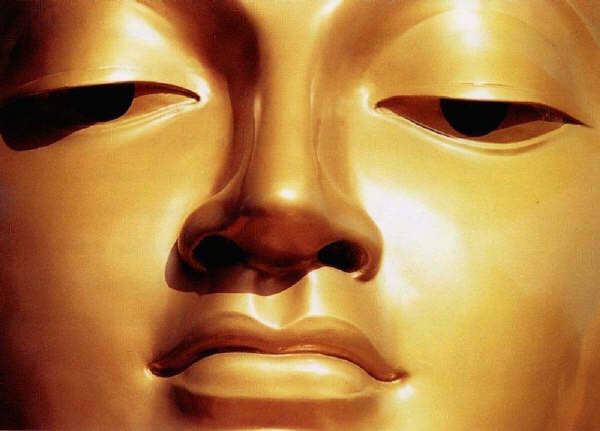 Hence, when many monastic members use the argument that “thou shall not speak ill of the jewel of samgha” to prohibit lay Buddhists from commenting on the speeches and acts of monastic members, their argument is actually based on anything valid in the Buddha-dharma, and it is against the spirit of the vinaya scriptures. Even if their lay Buddhist followers follow their instructions not to comment, should the samgha members fail to adhere to the virtue and spirit of vinaya precepts, can they really stop the public comments and criticism among so many people in the society? It had been a wholesome surveillance mechanism within Buddhist communities since the time of the Buddha for lay Buddhists to provide comments, suggestions, and even to bring up monastic members’ evil practices to be corrected. This is because many improper speeches and deeds might not have been bravely conducted in front of other samgha members within the residence of the samgha community. They might have taken place in public gathering places such as marketplaces after the monastic member stepped out of the samgha’s residential area. When such an event took place, the lay Buddhists’ reports would provide the samgha community a good opportunity to conduct “crisis management.” However, with the exaggerated explanations and even twisted interpretations of the ideas that “monastic affairs should be resolved within the monastic community” and that lay Buddhists “shall not speak ill of the jewel of samgha,” this system gradually stopped functioning. It has not only caused the imbalanced status and relationship between Buddhist samgha members and lay Buddhists, more seriously even, it has also affected the self-cleansing functions within the Buddhist communities. When lay followers bring up the monastic members’ improper speeches and actions, most of them provide their comments with a profound caring attitude with high expectations and good intentions for the samgha. Once the samgha community dismiss the self-cleansing functions facilitated by their lay followers’ comments, suggestions, and concrete reports about precept violation, then, if things get so serious, it will eventually become un-avoidable for the non-Buddhist members in the society and even the mass media to publicly attack Buddhism with sharp criticism, cold sarcasm, disrespectful mockery, and even severe condemnation. At such moments, we may not blame these people for their severe attacks and blows. When the people concerned and even the whole Buddhist community are exposed to such public humiliation and criticism, what we need to examine about ourselves is why our samgha communities have been so used to allowing mal-practices to happen, and why we cannot take it seriously to deal with the good-intentioned pre-warnings provided by our lay Buddhist followers. Just as I have found the argument invalid that “monastic affairs should be resolved within the monastic community,” I have also discovered that we cannot find evidences among the vinaya scriptures to justify the contention that “lay Buddhists (or cramanera or cramanerika) should not study the vinaya.” In response to such an argument, I have also written an article entitled, “Studying the Vinaya Does Not Block Cramanerikas from Taking the Vinaya Precepts: a Clarification.” No scriptural evidences can be found to prove such a statement. Besides, according to the records in the vinaya scriptures and basing on my actual experiences leading a Buddhist learners’ community, I think that, as novice practitioners embarking on the journey of serious monastic practices, upon entering the community, a cramanera or cramanerika, or even a female novice who is about to join the samgha community will need to learn about all kinds of regulations and precepts that a fully ordained bhiksu (bhiksuni) should follow. It is not sufficient enough for them to just learn about and keep the six precepts or ten precepts well. Otherwise, wouldn’t it be like “running the same country with two systems”? If they have not devleoped the everyday habit to abide by all kinds of precepts as a long-term habit, once when they are ordained, how can they remember so many varieties and contents of precepts within such a short time? Once when they violate the regulations or fail to keep the precepts, they will be condemned and punished. Wouldn’t that be a kind of abuse (in Confucian terms, “it is considered abusive if we kill a person without teaching that person first”)? Many monastic members are unwilling to allow lay Buddhists to study the vinaya. They think that once if the lay Buddhists learn about and become familiar with all the contents of upasampanna (upasampada), they might look down upon bhiksus (bhiksunis). Opposite to their ideas, I think if the lay Buddhists can understand the vinaya regulations and the reasons why they are set, they will truly understand how the monastic members lead their lives as commoners. Hence, they will not treat bhiksus as “saints” and make impractical demands upon them, or set incrediblly high standards for them. Furthermore, if the vinaya masters themselves interpret these precepts for bhiksus and bhiksunis in such a way that these precepts become so difficult to keep and so demanding that only a saint can put them into practice, then it is not surprising to find some lay Buddhists look down upon monastic members when they measure these members’ performances with such high standards. In fact, “the vinaya” is a part of everyday life. If a vinaya master teaches the precepts in such a way that even bhiksus and bhiksunis find them difficult to follow and uphold, and that they can only hide the contents of the vinaya from the public in order to prevent humiliation, mockery, or criticism, then there must be something wrong with the ways these vinaya precepts are interpreted. According to my research, except for very few precepts whose conventional prohibition has been discontinued in general among all contemporary Buddhist practices (such as “not to eat after lunch” and “not to hold money”), most precepts listed in the vinaya scriptures can all be re-interpreted in ways that will help us keep the core spirit of the vinaya precepts while allowing us to practice them in modern monastic lives. As for the precepts that have been broken, we can also discuss them in public, objectively analyze the reasons why these precepts are not closely followed nowadays, and figure out the best ways to apply these precepts in response to the circumstances of our contemporary world. Looking back, we could see that, two thousand and six hundred years ago, at a time when Brahmanism had been so dominant and treated as a “national religion,” the Buddha dared to challenge the system and propose the revolutionary ideal that “the J?tis (the four castes) should be equal.” He refused to accept the established discourses in the Brahmana such as the hierarchical idea that “Brahmans should come first and stay on top of everything.” He also put his ideal into practice to establish a Buddhist community within which “the four castes are equal.” All members in this community broke away from the myth that some castes were superior to other castes. Moreover, the only guiding principle for them to follow when it comes to the order to move, stop, enter their seats, having meals, and handling everyday life was according to the seniority when the members entered the community and became fully ordained. Originally, such a practice should be a major breakthrough in all religious histories. Under natural circumstances, out of their reverence and belief in Buddha-dharma as well as devout practitioners, lay followers tend to develop high regards for the monastic members and even dedicate extreme respect for bhiksus (bhiksunis). Unexpectedly, over time, after repeated practices, such kind of voluntary etiquettes and rites turned into some conventions, and then became regulated by some bhiksus as a systematic and institutional practice. Furthermore, these practices have been exaggerated and over-interpreted with the statements that “monastic affairs should be resolved within the monastic community,” that “lay Buddhists should not study vinaya”?all these have been done to elevate the status of monastics as highly as possible. Besides, it frequently happens that when lay Buddhists try to teach or spread the Dharma, they will be debased as “lay Buddhists sitting on top seats [teaching the Dharam].” It seems that, instead of taking it as ways to return the blessings of the Three Jewels and duties to help all sentient beings, some have considered shouldering the responsibilities to spread the Buddha’s teachings to be certain exclusive priviledge or possessions that solely belong to the monastic order. Hence, I cannot but sigh with a profound sense of pity and state: in fact, those bhiksus who promote the discourses and practices that “the monastic is superior to the lay Buddhists” or “men are superior to women” are just like “new Brahmans,” revived Brahmans in the body of Buddhists. The International Network of Engaged Buddhists (INEB) has provided a network for all Engaged Buddhist organizations, and it has been led by senior, respectable, and virtuous Ajarn Sulak Sivaraksa, who has been both wise and brave with his leadership. This has already set a very profound model in demonstrating equality among monastic and lay Buddhist communities. We hope that Engaged Buddhism can further constitute a powerful discourse that can comprehensively deconstruct the myth of “New Brahmanism” so that all four groups of Buddhist followers can grow in a wholesome and healthy Buddhist family where we trust each other, respect each other, love and care for each other. For this reason, I have written down this article so as to generate further discussions. By sharing my limited view points regarding the ethical issues about the relationship between monastic and lay orders, I look forward to receiving more expert opinions and feedback. The author now serves as a full professor, the Dean of the College of Liberal Arts and Chair of the Department of Religious Studies, Hsuan Chuang University, Taiwan. She has also served as the Head of Applied Ethics Research Center at Hsuan Chuang University. Dr. Doris L. W. Chang has served as Ven. Chao-hwei’s interpreter since 2006. She serves as an associate professor of the Department of English Language and Literature at Fu Jen Catholic University. She has chaired the Continuing Education B. A. program of the department since 2008. Ou-yang Chien. “Interpretive Notes on the Mottos of the Buddhist College of China?Part I.” Nei-xue Annual Journal, Vol. 3, 1st Ed. Taipei: Ding-wen Books, April, 1975, p. 646. Master Tai-xu. “Debating with Ching-wu on Being Buddhist Masters” Hai-chao-yin (?? ?Sounds of Ocean Waves) Vol. 8. Issue 9. Sep. 1927: 30-38. Similar discussions can be found in my earlier lectures when I was teaching Miao-yun Collections at Fu-yen Buddhist College on 19th November, 1990. Please see Chao-hwei Shi, “The Objectives to Learn Buddhism?Part II,” Study Guides for Miao-yun Collections (18), Miao-xin Magazine, Issue 74, March, 2003. The e-text version can be found at Miao-xin website: (http://www.mst.org.tw/?. In 1995, I taught the vinaya to monastic members during their summer retreat at Mi-tou Temple (?? ?, Temple of Amita-buddha) in Chia-yi, Taiwan. The same idea was also brought up at my lectures. Afterwards, the lecture was compiled by Ho Chien-hua (???). It was then edited and revised by myself and published as an article entitled “Resolving Monastic Affairs with the Monastic Communities.” That article was recorded and edited by Chuang Shu-hwei and later published in my book: Shih, Chao-hwei, A Bird Soaring in the Clouds Shall Fly Despite Its Fatigue. Taipei: Fa-chieh Publishing, 1996. p.p. 29-35. All the view points about “lay Buddhists studying the vinaya” and the three quotations in the article can be found in Shih, Chao-hwei. “Studying the Vinaya Does Not Block cramanerikas from Taking the Vinaya Precepts: a Clarification.” A Bird Soaring in the Clouds Shall Fly Despite Its Fatigue.Taipei: Fa-chieh Publishing, 1996. p.p. 37-48.